There’s just something about Persian Turquoise… the color of summer skies and crystal clear Caribbean waters; a bright spot on a dreary day. 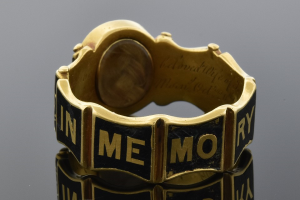 This cheerful stone was the darling of jewelers in the 1800’s. 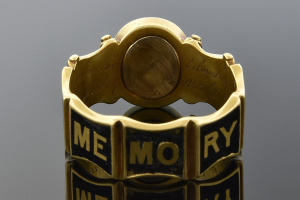 Albert and Victoria gifted it to the train bearers and ladies in waiting in their wedding ceremony in the form of bird brooches and tiny portrait rings. 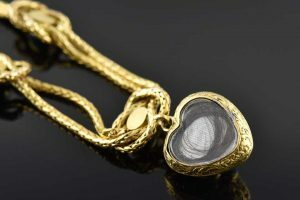 The stone was considered by many to be a talisman. 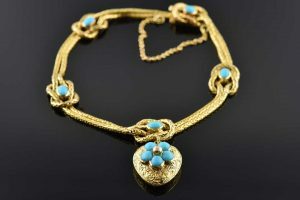 Turquoise was believed to protect the wearer against a myriad of things including poisoning and falling off your horse! 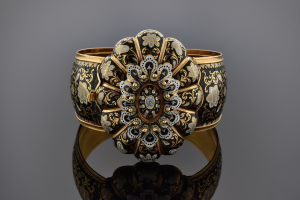 This charming bracelet was crafted at the end of the 19th century making it a crossover piece between the end of the Victorian era and the beginning of Art Nouveau. Handmade from a rich 18 karat yellow gold, this piece is super sweet. The main portion consists of two matching strands of woven chain. They create a series of five love knots, each one decorated with a bezel set oval turquoise. The love knot was a prevalent theme in vintage jewelry – symbolizing a love that lasts forever and cannot be untied. 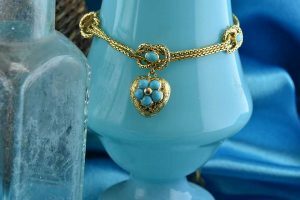 The center knot features an intricately etched heart charm with a turquoise flower. My favorite part of the bracelet is the hair receiver on the back of the heart… complete with a lock of dark hair still coiled inside… so romantic. The bracelet is in mint condition and priced at $2750.00. When you come to see it, be sure to mention that it’s in Joe’s Special Box. Imagine, if you can, what you will look like when you’re 200 years old… Will you be dust and ashes, scattered to the wind? Or perhaps there’ll be nothing left but a hollow shape, a shell of your former self. 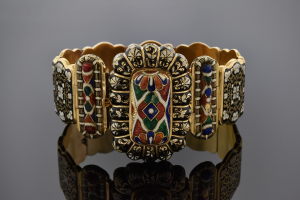 In any case, it’s certain that you won’t look as good as this stunning Swiss Enamel bangle. Admit it, no matter how many trips to the gym you make, or how well you take care of yourself – as the years pass, time takes a toll. 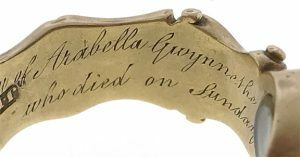 Nothing could be farther from the truth in regard to this bracelet. It’s in near perfect condition… almost identical to the day it was made, nearly two centuries ago. The center section, a scalloped oval of buttery yellow gold was hand crafted in classic repousse style (a technique in which metal is hammered from behind in order to create shape and form). Then this remarkably lightweight shell was painstakingly enameled from edge to edge in black and white patterns of flowers, leaves, and scrolls. 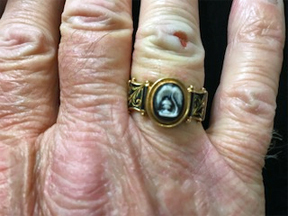 It’s a rare and beautiful thing, and in infinitely better condition than I will be in 150 years! Here are two more examples of Swiss Enamel jewelry. 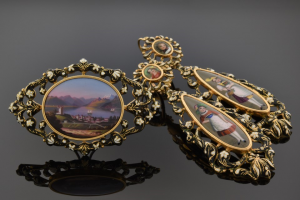 The brooch and earring suite is a more typical subject matter for the early 19th century. Often, these elaborate enamel plaques featured grand landscapes paired with peasants garbed in regional attire. More often than not, these scenic examples were sold as souvineers to wealthy travelers. Rich black and white enamel patterns create a framework for these lovely maidens. If you look closely at the bottom of the earrings in the second photo, you’ll notice a quite remarkable thing. Each one is accentuated by a tiny oval hair receiver. These are a first for me – I’ve never seen an earring with a hair locket! Even more unusual is that it’s on the front of the earring rather than the back. 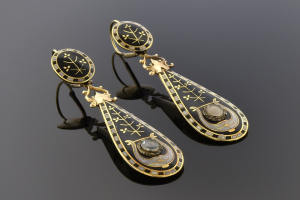 It’s interesting to note that both pairs of earrings shown above are referred to as “day to night” earrings – meaning that the bottom section is removable. You can wear the tops alone for a casual daytime look or add the dramatic bottom portion for more formal evening attire. Last but not least is this stunning polychromatic enameled link bracelet. 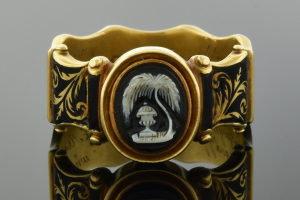 It features a rare combination of champlevé and basse-taille enamel. These two old world techniques combine in an explosion of multicolored design. From the alternating black and white floral links to the bright orange, red, green, and blue enameled plaques between… it’s a veritable feast for the eyes. 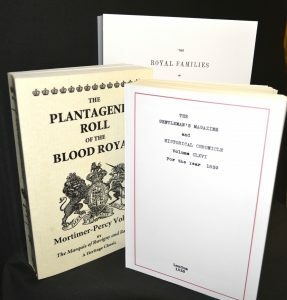 These are true treasures; too good to miss. And as always, you can go to a museum and look or you can come to us and touch. Click on the newsletter link below and have Joden Girl delivered right to your inbox!